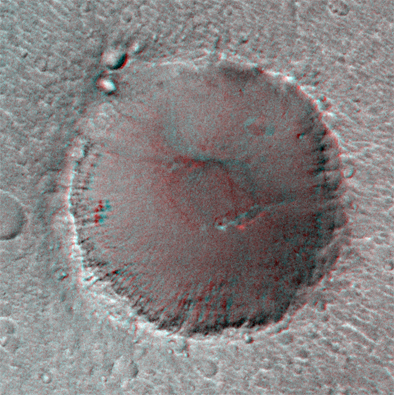 Explanation: Get out your red/blue glasses and check out this stereo picture of "Big Crater" on Mars! (Pieces of red and blue or green clear plastic will do. Your right eye should look through the red piece.) The stereo perspective was created by combining images from the Mars Global Surveyor spacecraft taken on two different orbits, each with a slightly different viewing angle. At just under a mile in diameter, Big Crater is not all that big but it is an important landmark in the vicinity of the Mars Pathfinder landing site on an ancient flood plain in Ares Vallis. Identifying corresponding smaller scale features in Pathfinder and Surveyor images will help to precisely locate the lander. Meanwhile, the line of sight between the Earth and Mars is approaching the Sun. During this period, known as solar conjunction, communicating with Mars Global Surveyor will be difficult.